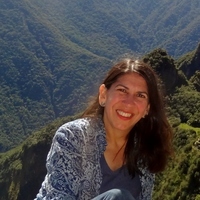 Astrid Ulloa is Full Professor of the Department of Geography of the Universidad Nacional de Colombia and head of the investigation group Cultura y Ambiente. She is one of the Principal Investigators at Gesma Network. She is also member of the Advisory Board of Asociación Ambiente y Sociedad Colombia. Her main research interests include indigenous movements, indigenous autonomy, gender, climate change, territoriality, extractivisms, and anthropology of the environment. She is author of The Ecological Native: Indigenous Peoples’ Movements and Eco-Governmentality in Colombia (2013). Her recent book chapters are "Reconfiguring climate change adaptation policy: indigenous peoples’ strategies and policies for managing environmental transformations in Colombia" (2018), "Feminisms, Genders and Indigenous Women in Latin America" (2018), "La confrontation d’un citoyen zéro carbone déterritorialisé au sein d’une nature carbonée locale-mondiale" (2018). Her recent articles include "Perspectives of Environmental Justice from Indigenous Peoples of Latin America: A relational indigenous environmental justice" (2017) and "Geopolitics of carbonized nature and the zero carbon citizen" (2017). She is currently writing about gender and mining and water in Colombia. To read the biography of translator Iván Vargas, please click here.